Kentucky began receiving its first group of refugees after the end of the Vietnam War in 1975 through Catholic Charities and the Archdiocese of Louisville. Since that time, Kentucky has had a proud history of welcoming refugees from all around the world. Today Kentucky is home to three refugee resettlement agencies with five offices across the state. Refugees are initially resettled in Louisville, Lexington, Bowling Green and Owensboro. Since 1994, over 29,400 refugees have been resettled in Kentucky. Many other refugees have moved to Kentucky after initially being resettled in another state. Kentucky is 9th in the nation in the number of refugee arrivals compared to other states. When including all eligible populations served by the Office of Refugee Resettlement, Kentucky ranks 10th in the nation. The refugee resettlement agencies in Kentucky operate the Reception & Placement (R&P) program, meeting refugee needs upon first arrival. This includes welcoming clients at the airport, finding and furnishing a first home, applying for a social security card, scheduling of initial medical screenings, enrollment in all eligible social services and registration of children for school. These agencies also provide comprehensive post-arrival services including case management, employment services and English language training programs. Kentucky is considered a “Wilson Fish” state meaning that the statewide refugee resettlement program is managed by a nonprofit instead of the state government. 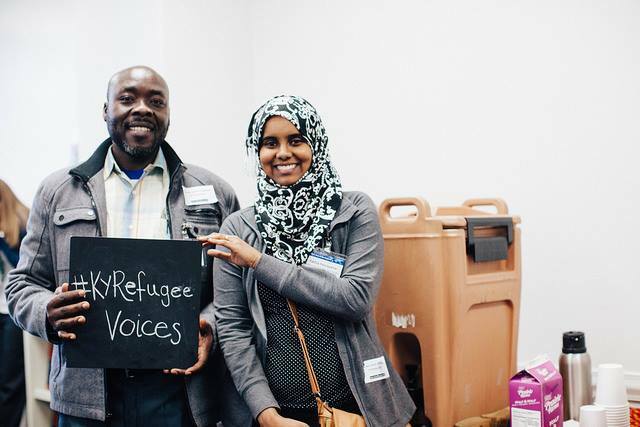 The Kentucky Office for Refugees (KOR) serves as the state refugee coordinator’s office and administers federal funding from the Office of Refugee Resettlement for post-arrival services. This department is located within Catholic Charities of Louisville.